MilliCheck & Micro IIi Readouts operate all popular makes of dual and single master type air gage members, as well as LVDT type electronic gages. Incorporating sealed controls, solid state pressure sensors, digital and bargraph LCD displays, these instruments perform exceptionally well on the shop floor as well as in metrology lab environments. 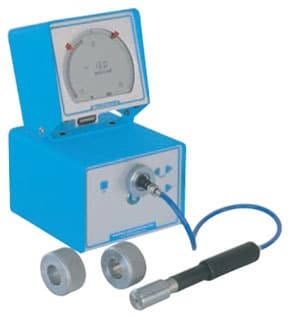 Air gage circuit – Pressure signals from solid state piezoresistive pressure transducers are sent to a microprocessor where the bargraph and digital display readings are calculated. Utilizing outputs from two transducers, one measuring the backpressure from the air gage nozzles, and one monitoring the regulator pressure, the microprocessor eliminates errors related to supply pressure variations. Being highly stable, Micro IIi & MilliCheck instruments can be operated using one or two setting masters. The adjustable flow restrictor incorporated in these instruments provides an exceptional range capability, accommodating gaging members with wide ranges of nozzle sizes and magnifications. LVDT gage circuit – AC voltage is supplied to the LVDT gage sensors which return signals proportional to the displacement of the sensor styluses from their null voltage positions. The LVDT gage module processes the voltage from the sensors and directs the signal to the instrument’s microprocessor where the bargraph and digital display values are calculated. Polarity and Channel switches provide capability to sum or difference inputs from the sensors. master air probe and setting rings. MilliCheck gage readouts feature high resolution LCD bargraphs and four decade digital displays. Designed for low power consumption, they operate from either standard “D” Cell batteries or AC power adapters. With user selectable multiple inch and metric gaging ranges, these readouts provide economical replacements for mechanical air gage instruments. They can be configured for either LVDT type electronic gages or air gages. 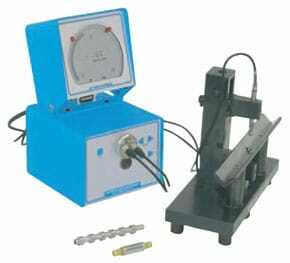 Select gage type listed below and add a suffix to order code as shown at the bottom of this page. Series 10 Air gage — All dual master type air gages. 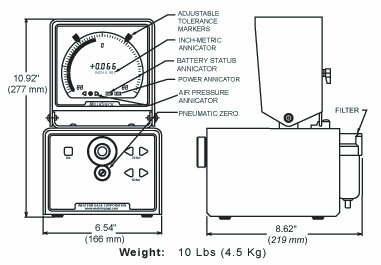 Series 60,70 or 80 Air gage — Single master type air gages. E1, E2 or E3 High resolution LVDT — use on scale ranges ±.0015″ or ±.030 mm or less. E4, E5, or E6 Extended range LVDT — Use on ranges ±.00075″ or ±.015 mm or greater. 110/125 VAC – 9 VDC, 60 Hz, adapter is standard. 100-240 VAC – 9VDC, 47-63 Hz, universal adapter with optional field changeable foreign outlet plugs. * MilliCheck instruments incorporate an auto off mode to extend battery life. Actuating the power button wakens the gage with no loss of calibration. The auto-off mode can be turned off when operating from external power.